Nadi Legends Club (Fiji Soccer): NEW INTERVIEW: Our new interview with Lote Delai (Ba / Fiji) & Pravin Sharma (F.G.W.U. president), 2015. 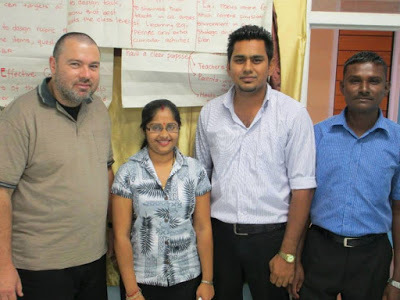 NEW INTERVIEW: Our new interview with Lote Delai (Ba / Fiji) & Pravin Sharma (F.G.W.U. president), 2015. Henry Dyer (first left) pours a drink for Lote Delai (second left) and other friends outside Govind Park before the 2015 IDC Final Ba versus Nadi. Nadi legend Henry Dyer and I met these people down at the Ba River Rugby Ground (across the road from the bus station) by chance on the late afternoon of Thursday 15 October 2015. The FSC union president Pravin Sharma was enjoying a carton of longnecks with Lote Delai and some of the other FSC boys and they were only too happy to talk to us. Henry Dyer (Nadi and Fiji legend): Watching the 2015 IDC Final at Govind Park what do you think of Nadi’s downfall against Ba? Henry Dyer (left) and Lote Delai @ FFA Veterans' Dinner. Lote Delai (Ba and Fiji legend): The downfall of the Nadi team was in defence. They did not know what to do with the ball; they hung on to the ball. That is how Ba capitalized and scored that first goal. The Nadi defence forgot that Ba had a combination of strikers that could penetrate the Nadi backline without any hard struggle. Nadi’s downfall was also because when the team was in attack the defence forgot to fall back into vacated space. This is where the Ba attack took advantage. Henry: Lote, what do you think of the standard of soccer today in Fiji? Lote: It’s not at that [former] level. Mr Pravin Sharma (President, General Workers’ Union, Fiji Sugar Corporation, Ba Town): I do agree with him. Lote: Before we were taught about the structure of the game, possession, how to score the goals, and what to do in attack and in defence. Henry: Today they learn the same things at training, yes? Lote: That is very true but the difference is how to kick that ball into the goalmouth and how to make a score. Knowing how to play the game in defence and attack are the two main things. Henry: What do you think should be done for Fiji Soccer to raise the level of the sport up to a standard where we can move up the [world] rankings again? Tony Kabakoro, Henry Dyer, Julie Sami @ 2015 IDC Final. Lote: Henry, you should just look at the rugby community. Before we were pushed around at the World Cups and Pacific Nations at the scrums and the line-outs. When they threw the ball in the lineouts there was a big question mark about how that guy got selected in the Fiji team. The difference today is that rugby has done a great job at this 2015 World Cup [18 September – 31 October 2015] by patching up all these weaknesses. Even though we lost [Fiji: won 1 lost 3, points for: 84, points against: 101, points: 5, final position: fourth in Pool A], the public is happy that we were up to the level of their opposition such as England, Wales, and the Wallabies. Soccer should think about that and follow those strategies. Henry: Who do you think are some of the people in soccer circles who can come in to revive our soccer image with some soccer brains? Lote: Vimlesh Singh would be one of the best as he has a vision. He played the sport and he can walk the talk. Pravin Sharma: In year 2015, when we see the IDC, I think that soccer in Fiji is falling backwards. We can’t see deadly strikers now like we used to see in the former era. This is due to lack of mental and physical power. No-one thinks of what is done mentally to reach the target. You must know which angle, which way, and with what power to hit the ball. It is like you don’t wear a condom to make a baby [all laugh]. We talk about strikers like Inia Bola [and] Ravuama Madigi; they were called deadly strikers. And there was a man like Henry Dyer. During his time he was one of the best midfielders in Fiji. Deadly striker Inia Bola was called Golden Header. At the last moment Inia came in to head the ball from a corner-kick. Even at one IDC Lote Delai made us win from a 40-yard out score. I’m quite happy to be a Ba fan too. What I am trying to say is that, although Ba won the 2015 IDC, they don’t have the good strikers like Madigi, Rusiate Waqa, and Inia Bola. They were called deadly strikers; like a cobra when they strike the venom came out. We can’t trust any player at Ba now to score a goal. I’m happy Ba won the IDC Final but I think they just won by luck not by playing soccer. I hope that the star players would agree with my comments. I’m happy that Ba won but I didn’t see the soccer that I used to see. This is the downfall of Fiji Soccer. We don’t have a great player that can produce that goal. We don’t trust the players anymore. Lote, do you agree with my comment? Henry Dyer and Julie Sami talking about old times. Pravin: The standard of Fiji Soccer has fallen down. Inia was always called Golden Header; when the ball goes to his head the goal is there. We always trusted him to score the goal. No-one has been able to take his place, isn’t that right, Lote? In Fiji soccer I have never seen as good a header as Inia Bola, Madigi’s brother. When we have a corner-kick for Ba nowadays we know it will not go into the goal especially [via] heading. In Inia’s time we knew the corner would go into the goal especially from the header. The other great players were Jone Nakosia, Lote Delai, and Julie Sami. Soccer is not only played physically but mentally. You must make a pattern. It also depends on the corner-kicker and not just on the players doing the heading. These days we don’t even have the backs like Jone Nakosia or Kini Tubi. Lote: The danger zone is the defence side. In any sport we learned from the professionals that when you go on to the field you must be ready to go out on to the field. But before that you must be prepared at home. You must sort out home problems first so that at the ground your mind is free to play at your best. An example is David Campese. When he went to play at the 1991 World Cup he had the same problem we talked about here. He solved his problem at home and then became the best player at the World Cup and the Wallabies won the tournament. He had domestic family problems. It shows that every sporting individual fits into the same category. You may not be able to perform if you had an argument with your wife or children. Your mind would be somewhere else. You would not be able to perform. … There is no development here [in Fiji soccer]. Henry: Why is Ba not scoring from the headers? We have an academy here. Lote: Because no-one is there to teach them. Kieran James with Mr and Mrs Julie Sami. Henry: Then why is the academy there? Pravin: Corner-kicks are wasted now in Fiji. It’s a goal opportunity. Lote: It’s a must goal. Pravin: Have we got such a person here in Fiji now like Mr Inia Bola? Pravin: Thank-you, sir; that is my comment; why don’t we create a striker who is expert with the foot and with the head? There should be help given in a financial way for people like Inia Bola to teach heading and left and right-kick. He can be brought in to teach the Ba team. They must learn to score a goal with their head and not just their feet. No-one was as perfect as Inia Bola in scoring with the head from the corner. He is God-gifted with skill. That is the sort of person who should be brought in to teach special skills. Now the corner-kicks are wasted as the prof [Kieran James] says. Henry: So why don’t they bring Inia Bola in? Pravin: He should be given financial status to sell his skills. Who is the highest-paid soccer player in the world? Inia must look after his family so financially he should be supported. Henry Dyer in the Nadi team should be sought for his help even though a coach is there. They should at least respect his skills. Lote Delai should be respected too. Ba Soccer [Association] should seek separate skills from the separate players. They will be the best players to give answers. Why don’t they seek Henry Dyer’s help? They should financially assist him. You don’t throw away a person when he is old. You respect him and buy his skills. [Indigenous] Fijians don’t need much money [because of their lifestyle]. My friends here are Lote and Henry Dyer. Fiji people don’t need many finances; they need a lot of respect. Even if you give a loaf of bread to Lote Delai or Henry Dyer they would give their skills. The truth is Fiji is the very best country in the world. We don’t need a lot of support from the pocket but we need dignity and respect in the traditional way. If you give $1 of grog [probably meaning kava but possibly means beer] they will not say no to give their skills. But now respect is fading away. The coaches must seek blessings and skills of the previous older players which they are not doing now in a good manner. Henry Dyer and star Ba striker Inia Bola. Lote: Why don’t you put the old players to be the coach? Pravin: Yes, I do agree with that. The coach of Ba at the present time does not have the knowledge or skills. What soccer knowledge does the current coach of Nadi have? Henry: He has the certificate. Pravin: They never played on the field. They have it theory wise and not practical wise. Lote and Henry have it in theory and practical both. Mr Penaia Paio (age 40): I just want to conclude the interview. Pravin: I want to conclude first. Henry: Let our friend conclude. Pravin: My question is to the [soccer] professionals here. Can you show me one professional rugby team or professional soccer team with coach who has not played on the field? All professional rugby and soccer coaches have played on the field. That is my conclusion. Dr Kieran James (Accounting Professor, University of Fiji, Saweni campus, 2013-2015): So the Ba and Nadi coaches have not played the sport? Inia Bola's wife Sebuwaia and the granddaughters. Henry: No, they are just school-teachers. They have a certificate theory wise but they do not have the practical experience. You need the theoretical and the practical expertise. You [should] look at someone like Maradona. Lote: You have to show the players what you can do. Pravin: I agree with you. You must show them what a striker must do. The duty of a striker is to score goals, simple. KJ: Please tell me your opinion about Henry Dyer as a player. Pravin: Henry Dyer was a dangerous midfielder. During his time he was one of the best midfielders in Fiji. He always fed the ball to Rusate Waqa, who was [as fast as] a Melbourne Cup racehorse. That was the danger time for Ba team; they had to be admitted to ICU [Intensive Care Unit]. [Note: This was just a way of speaking; Ba team was not admitted to the ICU.] Rusiate Waqa was one of the fastest strikers. When Waqa had the ball, fed by Henry Dyer, oh my God, the defence just fell down. Julie Sami, Henry Dyer, and young Ba supporter Jolame Ratu @ IDC Final, Ba versus Nadi 2015, Govind Park. The Ba fan is Jolame Ratu, age 12, Class 6, from Ba Sangam School and Verata Village, Tailevu. Inia Bola and his family during his playing days. Henry Dyer, Inia Bola, and granddaughter of Inia Bola. Henry Dyer, Prof Kieran James (University of Fiji), Inia Bola, and granddaughter of Inia Bola, 17/6/2015. Prof Kieran James (University of Fiji soccer researcher) and Inia Bola. Henry Dyer (left) and Inia Bola point across the hills to where Fiji teammate Joe Tubuna's body is buried in Soweri Village Cemetery.